Adoption Application - Website of Pet Helpers, Inc. Please complete the adoption application form below. For fields that do not apply to you, please enter N/A. If you prefer to download and email the application, there is a link provided at the bottom of this page. 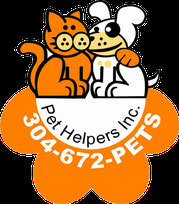 Thank you for inquiring about a Pet Helpers pet. All of our pets are located in WV. We do not ship or transport so if approved for adoption you must be able to drive to WV to get your new pet. Despite your excitement to add a new pet to your family please read all parts of this application. Taking on the responsibility of a pet is a long term expensive commitment. You should not enter into this process lightly and you should give it more than a moments thought. From the moment you get this pet every decision you make in your life will require you to think about the pet also. If you move, if you marry or divorce, if you have a child, if you change jobs or take on an additional job. Financially do you know what this pet will cost you. If you are adopting a puppy or kitten will you have the finances to fix the pet on your own with out assistance from a humane society, rescue or spay/neuter program. This is important to us because we want the families that adopt our pets to be able to afford their vet care both routine (vaccinations, spay/neuter, parasite preventive) and extreme (accidents and illness). The financial assistance programs are for those that really can't afford the spay and neuter procedure. If you can't then you should wait to adopt when your finances are in a better place. Our pets have been seen by a vet prior to their adoption. There is no health guarantee. They are as healthy as we can make them prior to adoption to their new families. If you are adopting a puppy it is not fully protected against disease until 2 weeks after the 3rd booster shot so great care should be taken to keep them in an area known to be free of the parvo virus. In other words you would not take them to a place frequented by other dogs like a dog park, pet store floors, rest areas, etc. Spay and neuter is best done at 4 months of age IF your vet will. There are known cases of puppies and kittens coming in heat at 4 months so great care needs to be taken with your pet until you are able to get them fixed and that needs done by 6 months of age at the latest unless there is a medical reason it can not be done. What type of home are you living in? If you rent, does your lease or rental agreement allow pets? Are you aware of the pet deposit you will be responsible for paying if you are renting or leasing? Besides you, who else will reside with the pet? Please enter name, relationship, and age of each individual. Does everyone in the household want a new pet? Have you seriously considered the current and future costs of owning a pet? If you do have a fenced yard, what type of fence do you have? Where will the pet be kept while you are not at home? Typically, how many hours a day will the pet be home alone? Is this pet going to be an indoor pet with the exception of potty and play time? What types of pets do you currently have? Please list type of pet, breed, and age. Are your current pets up to date on their vaccinations? What kind of pet food do you feed or will you feed the new pet? What veterinarian do you use or do you intend to use with the new pet? Have you ever given up a pet to another organization, rescue, pound, shelter, or private individual? If you are adopting a puppy under 5 months old, you will be responsible for spaying/neutering that pet when they are 5-6 months old. Depending on where you reside, this procedure can cost anywhere from $150 - $400. Are you prepared for this expense and can you afford it without using the resources of an outside agency that provides spay and neuter assistance to those that need it? Please list 2 people that are NOT related that have known you for at least 5 years. Please list name and phone number. Please list 1 relative that is not currently living in the same home as you. Please list name and phone number. Please use the space below to tell us anything else that you think we should know about you and your family. Or, tell us about your current or previous pet(s). 1. If you adopt a puppy or a kitten, you are required to sterilize him or her by six months of age. Adult dogs that are not spayed / neutered when adopted are required to be sterilized within 2 weeks of adoption approval and placement. 2. Owner is required to submit veterinarian-supplied Spay/Neuter Certificate or copy of receipt for animal within 10 days of animal surgery. 3. If adopting a cat or dog from Pet Helpers Incorporated, you will keep him/her indoors other than normal bathroom and play time. The safest place for a cat is indoors only and we would prefer you keep the cat you adopt from us as an indoor only pet. 4. If adopting a dog, you will abide by your area leash law. 5. You are required to return the animal to us if you feel you cannot keep him/her. You must not sell the animal or give it to anyone else. 6. You are responsible for providing proper shelter, food, water, exercise, medical care and humane treatment at all times for your companion animal. 7. Pet Helpers has the right to retrieve ownership of the pet at any time if they feel that this dog is in any kind of an abusive situation, not being fed, watered, not being taking to the Veterinarian for annual shots and exam, needing Veterinarian care that is not being given, being kept as a outside pet or engaging in any kind of behavior that will harm the pet. 8. I understand that Pet Helpers reserves the right to do a home visit. Owning an animal is a huge responsibility. This animal could live as long as 15-20 years. Veterinarian bills will not be cheap. Spay/neuter can be costly. Before adopting, you must carefully think this through and realize the commitment you are making. Animals are not disposable. When you adopt, you are agreeing to make them a part of your family for life. What are you willing to do, to make accommodations for your pet in the future. Moving is not a good excuse for dumping your pet. You must consider not only the cost of feeding, care, medical expenses, but the vast amount of time and training required to make your pet an acceptable companion. If you have the slightest inclination that this animal will end up in an animal shelter or chained to a doghouse at some point in the future, do not adopt. Do not adopt any animal on a whim. Be especially cautious when adopting at holiday time. Make sure that you are making a commitment, not just purchasing a gift. Please make a responsible decision to be a responsible pet owner. I certify that the information given on this application is true and correct. If I am approved by Pet Helpers Incorporated I agree to all the above requirements and below. I understand that failure to comply with any of the requirements will result in confiscation of adopted animal. I agree that if I pay using a check, that my account will be debited electronically for both the face amount and returned check fee if the check is returned for NSF reasons. Our adoption fee for mixed breed puppies and adults dogs is $150.The adoption fee for full blooded puppies and adult dogs is $225. Cat adoptions are $50. Senior dogs are negotiable (8 and over). Regardless if the dog is a mixed breed or full blooded they are spayed/neutered prior to adoption IF they are old enough. If they are too young at the time of adoption, then it is your financial responsibility to spay/neuter the pet by the age of 6 months and you must provide proof for our files that it has been done. Same rules apply to cats. All of our pets are checked by a vet, given the shots appropriate for their age and any other treatment deemed necessary by the vet. All of our pets are adopted as indoor pets and are not to be outdoors tied to a box 24/7. We are a foster based rescue and do not have a facility. The pet you are adopting has been living in a home with a foster family. You are expected to take possession of the pet you are applying for within a few days of application approval, which will enable us to accept another pet into that home. Because we are a rescue, and believe that spaying and neutering is crucial in stopping the reproduction of unwanted puppies and massive amounts of dogs dying daily in shelters across the country, we expect any dogs already in your home to be spayed and neutered. Please download, complete the form, and send to adoptionisforever@pethelpersinc.org. If you have completed the online application form above, there is no need to download and complete the PDF application.